The Bermuda Business Development Agency [BDA] has launched a new digital portal targeting global insurance customers and connecting them to Bermuda’s top-tier market for risk coverage. The Bermuda Risk Directory website [www.brd.bm] offers access to the island’s brokers, as well as insurance, reinsurance, captive insurance, and insurance-linked securities sectors, connecting users to the market’s globally-respected companies. Leveraging commissioned market research by Deloitte, the site represents a contemporary relaunch of the popular former Bermuda Market Solutions website and booklet. “We’re excited to launch this intuitive, robust digital platform to underscore the capacity and innovation across our insurance and reinsurance market,” said BDA Business Development Manager Jereme Ramsay. “Building on the core principles of its predecessor, this website’s advanced search mechanism, navigation and mobile optimisation are designed to help drive new business to our world-respected jurisdiction. With pull-down menus offering access to more than two-dozen lines of business, the new website provides listings for participating companies , a brokers directory and Find-a-Broker search mechanism [brokers are required for Bermuda market access by US-based clients]. Users will also find an overview of the Bermuda insurance market and links to key industry groups and institutions, such as the Association of Bermuda Insurers and Reinsurers [ABIR], Bermuda International Long Term Insurers and Reinsurers [BILTIR], Bermuda Monetary Authority [BMA], and Bermuda Stock Exchange [BSX]. Alan Waring, past president of the Bermuda Insurance & Reinsurance Brokers Association [BIRBA] and one of the pioneers of the late-1990s Bermuda Market Solutions resource, said he was proud its legacy would continue. BDA will manage the site, working with Deloitte and design, website and advertising agency Cosmic to update the complimentary participant listings and data every six months and grow its directory with additional companies. “The BDA has done a fantastic job in developing the new BRD website, which now offers an unparalleled overview of products offered by the insurance and reinsurance market in Bermuda,” said Dan Roberts, Senior Manager, Consulting, Deloitte Ltd. The site’s searchable database filters and sorts results in a modern, responsive framework to ensure ease of use by both desktop and mobile devices. 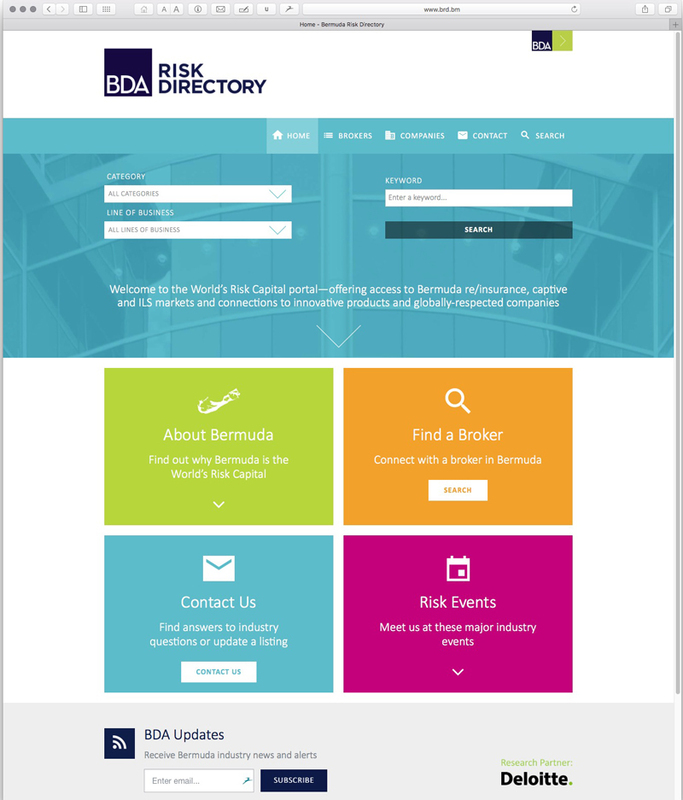 Bermuda-based insurance, reinsurance, broking, captive or insurance-linked strategy companies that would like to be added to the Bermuda Risk Directory can click here to provide new information or update a previous listing, or email riskdirectory@bda.bm.